Aim: To study the effect of 6 months yoga program in patients suffering from chronic kidney disease (CKD). Materials and Methods: Fifty-four patients with CKD were studied and divided into two groups (yoga group and control group) to see the effect of yoga in CKD. Patients in the yoga group were offered yoga therapy along with other conventional treatment modalities, while the control group was only on conventional treatment. Subjects in yoga group were trained to perform specific yogic asanas for at least 5 days a week for 40-60 min a day. Regular monitoring of blood pressure, renal function, requirement of a number of dialysis, and quality of life (QOL) indicators were done. Fifty patients (yoga - 25; control-25) completed 6 months follow-up. Results: In yoga group, a significant reduction of systolic and diastolic blood pressure, significant reduction in blood urea and serum creatinine levels, and significant improvement in physical and psychological domain of the World Health Organization QOL (as assessed by BREF QOL scores) were seen after 6 months. In control group, rise of blood pressure, deterioration of renal function, and QOL were observed. Poststudy comparison between the two groups showed a statistically significant reduction of blood pressure, nonsignificant reduction in blood urea and serum creatinine, and significant improvement in physical and psychological domain of QOL in yoga group as compared to control group. For subjects in yoga group, the need for dialysis was less when compared to control group although this difference was statistically insignificant. Except for inability of some patients to perform certain yogic asanas no adverse effect was found in the study. Conclusion: Six months yoga program is safe and effective as an adjuvant therapy in improving renal functions and QOL of CKD patients. All these therapeutic modalities are expensive and beyond the reach of majority of patients in India. Besides, such procedures are focused on treating the manifestation of disease and not the underlying cause of disease. Researches in the past have shown that yoga does play an important role in controlling hypertension and diabetes. ,, In one study, it was found that the Corpse pose (shavasana) reduces blood pressure and the need for antihypertensive medication. Another study showed that yoga is effective in reducing blood pressure, blood glucose level, serum cholesterol, and body weight. Kashinath et al. in their hypothetical review article described how yoga can work in CKD. As diabetes and hypertension are major causes of CKD and yoga has a definitive role in controlling them, it is logical to think that it would be beneficial in CKD also. With this background, we undertook this study to find out whether the old Indian science of yoga could emerge as a viable and safe tool in the management of CKD. The study was conducted at the Department of Medicine, Lala Lajpat Rai Memorial Medical College, Meerut, India, during 2009-2010. The study involved 54 patients with CKD who were admitted to medicine ward. This was a prospective study. Patients with CKD were followed for a period of 6 months to see the effect of yoga on them. Patients admitted in our institute who were diagnosed as having CKD on the basis of clinical profile and relevant investigational finding. Those between 20 and 80 years of age, who gave written informed consent for completing the entire span of project for 6 months and who were mentally and physically fit up to a minimum level to understand and perform yogic asanas were included. Those aged <20 years and more than 80 years. Those with a history of any substance abuse, mental illness, or conditions which in opinion of investigator would make it difficult for the potential participant to participate in the intervention such as ischemic heart disease, postcoronary artery bypass grafting, those with comorbid CAD, morbid obesity, uncontrolled diabetes, uncontrolled hypertension, those with single working kidney, congenital renal malformations, h/o carcinoma in the past, or any other renal pathology or surgery in past were excluded from the study. Detailed history, clinical examination, and QOL scores World Health Organization QOL (WHOQOL-BREF)  were recorded at start of study. WHOQOL-BREF consists of questionnaire for four domains, i.e., physical, psychological, social, and environmental. Score for each domain was calculated separately. Total score for each domain is 20. Baseline investigations including complete blood count, blood urea, serum creatinine, serum sodium, serum potassium, serum calcium and phosphate, screening for HIV, hepatitis-B and hepatitis-C, and renal ultrasound were done in every patient. Other investigations which may be considered appropriate for individual patients such as Vitamin D, parathyroid hormone, 24 h urinary protein, renal Doppler, and renal biopsy were carried out in selected patients. In follow-up, patients were reassessed on the basis of clinical status, QOL scores, and renal functions. Repeat investigations were done at 3 and 6 months. Supine asanas - Sphinx pose (Salamba Bhujangasana), bridge pose (Setu Bandhasana), boat pose (Naukasana), reclining bound angle posture (Supta Baddhakonasana), bow pose (Dhanurasana), crocodile pose (Makrasasa), and corpse pose (Shavasana). Yogic relaxation techniques with imagery or mindfulness-based stress reduction for 20 min at the end of asanas and pranayamas. Techniques and illustrations of these along with the necessary precautions were given to each participant in the form of a booklet, yog pustika, published in Hindi, the local language. Participants were told to practice yoga regularly for at least 5 days a week for 40-60 min a day. All asanas were not mandatory. Patients were advised to maintain a diary of attendance which they had to show to investigator in every follow-up visit. About 80% attendance was necessary for inclusion in the study. For statistical analysis, results of all clinical parameters and QOL domain scores were tabulated. Mean of each of these parameters and standard deviation (SD) along with change on these parameters were calculated for each group at baseline and at 6 months. All the data were expressed till two decimal places and presented as ±1 SD unless stated otherwise. Significance of difference within each group was calculated by paired t-test and between yoga and control groups was calculated by independent t-test. The significance level of 5% has been considered for reporting the results. The calculations were done either manually or using Statistical Package for Social Sciences version 10.0 (IBM India Private Limited). The present study involved 54 patients. Twenty-five out of 28 (89.29%) in yoga group and 25 out of 26 (96.15%) in control group completed their 6 months follow-up. Among those who completed follow-up, there were 11 males (44%) and 14 females (56%) in yoga group and 12 males (48%) and 13 females (52%) in control group. The baseline characteristics of the patient population are detailed in [Table 1]. There was no significant difference between the study and the control groups at baseline in any of the characteristics examined (independent t-test P > 0.05). Subjects in yoga group received yoga therapy in addition to conventional treatment modalities while subjects in control group were only on conventional treatment (such as antihypertensives, diuretics, dialysis as when required, and other supportive medications). 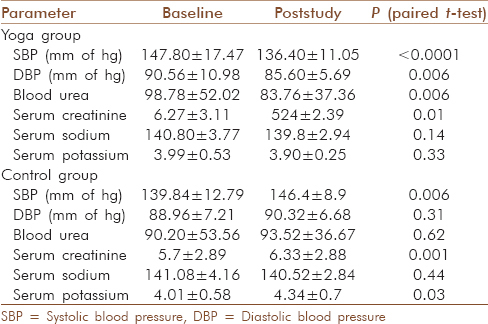 In yoga group [Table 2], significant reduction of systolic blood pressure (SBP) (paired t-test P < 0.0001) and diastolic blood pressure (DBP) (paired t-test P = 0.006) was observed after 6 months. Blood urea and serum creatinine also showed significantly decreasing trend (paired t-test P = 0.006 and 0.01, respectively). There was nonsignificant reduction of serum sodium (paired t-test P = 0.14) and serum potassium (paired t-test P = 0.33). There was a significant improvement in physical and psychological domain of QOL (paired t-test P < 0.001) after 6 months [Table 3]. In control group [Table 2], rising trend in SBP (paired t-test P = 0.006), DBP (paired t-test P = 0.31), blood urea (paired t-test P = 0.62), and serum creatinine (paired t-test P = 0.001) was seen at 6 months. No significant change was observed in serum sodium and potassium levels. There was a significant improvement in physical domain (paired t-test P < 0.001) of QOL while no change in psychological, social, and environmental domain [Table 3]. 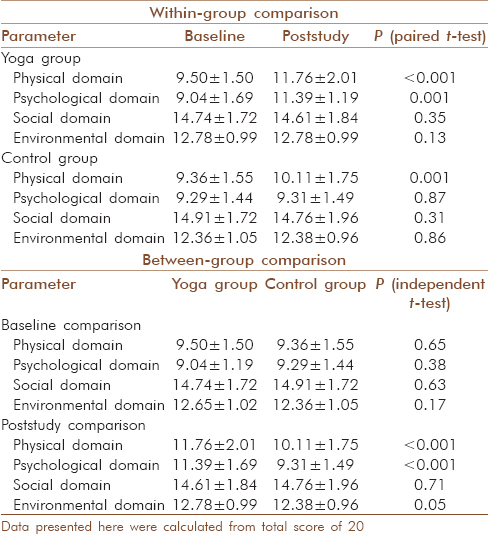 At baseline [Table 1], there was no significant difference in any parameter between yoga and control group. At 6 month [Table 4], there was significant reduction in SBP (independent t-test P = 0.001), DBP (independent t-test P = 0.01), and serum potassium (independent t-test P = 0.006) and nonsignificant reduction in blood urea, serum creatinine, and serum sodium (independent t-test P = 0.35, 0.29 and 0.38, respectively) was seen in yoga group as compared to control group. Significant improvement in physical (independent t-test P < 0.001) and psychological (independent t-test P < 0.001) domain of QOL was seen in yoga group as compared to control group [Table 3]. 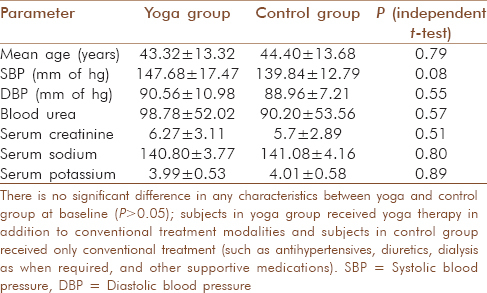 In yoga group, lesser number of dialysis was required in comparison to control group although the difference was not statistically significant [Table 5]. The present study demonstrates the favorable role of yoga in improving blood pressure, renal function, and physical and psychological aspects of QOL in patients with CKD. Yoga is an ancient Indian way of life, which includes changes in mental attitude, diet, and the practice of specific techniques such as yogic postures (asanas), breathing practices (pranayamas), and meditation to attain the highest level of consciousness. The anatomical overview of postural exercises in yoga suggests that these exercises are centered toward stretching and strengthening of muscles and increasing blood supply. Pranayama practices stretch the lung tissue producing inhibitory signals from action of slowly adapting receptors and hyperpolarizing currents. These inhibitory signals coming from cardiorespiratory region involving vagi are believed to synchronize neural elements in the brain leading to changes in the autonomic nervous system, and a resultant condition characterized by reduced metabolism and parasympathetic dominance. Pranayama modifies various inflatory and deflatory lung reflexes and interact with the central neural element to bring new homeostasis in the body. In a study, it was found that 30 min of hath yoga practice daily for 4 months showed a significant reduction in oxidative stress (malondialdehyde, protein oxidation, and phospholipase A2 activity) and increase in antioxidant activity (superoxide dismutase and catalase activities) in patients with CKD who were on hemodialysis. Researches had shown that higher sympathetic tone is potentially involved in the progression of CKD, promoting hypertension, and causing target organ damage. , There is evidence that suggests yoga reduces sympathetic tone and improves parasympathetic tone thereby reducing pulse rate, SBP, DBP, and metabolic rate. , The present study supports previous studies that yoga plays a statistically significant role in stabilizing both the systolic as well as the DBP levels. The present study also unfolds the significant role played by yoga in controlling renal dysfunction as assessed by blood urea and serum creatinine values. The patients undergoing the yogic exercise regime along with conventional treatment showed a significant reduction in blood urea and serum creatinine values over a period of 6 months, whereas there was rising trend in patients kept in the control group. This can be attributed to the significantly beneficial impact of yoga on renal functions. Dysnatremia is common in CKD. Normal renal function guarantees that the tubular reabsorption of filtered sodium and water is adjusted so that urinary excretion matches intake. In CKD, this balance is disrupted such that dietary intake of sodium exceeds its urinary excretion resulting in sodium and water retention. This causes extracellular fluid volume expansion which in turn contributes to hypertension that itself can accelerate the nephron injury. Similarly, in CKD, there is disruption of potassium secretory mechanism in distal nephron that can result in hyperkalemia. Here, we found that poststudy serum sodium (P = 0.38) and serum potassium (P = 0.006) were lower in yoga group as compared to control group. This effect might be due to improved renal function and increased excretion which in turn normalizes blood pressure and prevents further nephron injury. There is another view that an important cause of the defect in renal excretory function in hypertension is an increase in renal sympathetic nerve activity. Yoga by improving sympathetic tone reduces blood pressure. This in turn improves excretory mechanism and results in normalization of water and electrolyte balance. In another randomized controlled study on hemodialysis patients, 12 weeks yoga intervention has proven to be safe and significantly effective in managing the pain, fatigue, sleep disturbance along with significant improvement in hand grip, significant reduction in creatinine, blood urea, alkaline phosphatase, and cholesterol along with significant improvement in erythrocyte and hematocrit count. The present study shows that in addition to improving renal function, the need for dialysis is reduced in patients undergoing yoga therapy over a period of 6 months. Yoga thus helps in decreasing economic burden on the patient which is especially desirable in a country like India where the socioeconomic condition of the majority of the population is below average. Many CKD patients experience psychological symptoms including depression, anxiety, distress, and mood disturbances as a consequence of long-standing disease. Previous studies suggest the role of yoga in improving QOL in various disorders such as lupus nephritis patients with CKD, cancer, Parkinson's disease, chronic low back pain, and depression. ,, Our study also substantiates the profound effect of yoga on the QOL of patients with CKD. In the present study, we used WHOQOL-BREF questionnaire developed by the WHO to assess the QOL. It was observed in the study that there is a significant improvement in physical (independent t-test P < 0.01) and psychological aspect of QOL (independent t-test P < 0.01) of patients in the yoga group at the end of 6 months vis-a-vis the control group. However, there was no significant change in social and environmental aspects of QOL at 6 months with yoga therapy. Further studies are required over a longer period of time to study the impact of yoga on these aspects of life. Barring a few limitations like small sample size and inability of some patients to do complex yogic exercises the study otherwise proves fruitful in establishing the positive role played by yoga in combating the physical, social, and financial aspects of CKD. Six months yoga program is safe and effective measure as adjuvant therapy to conventional treatment modalities in reducing blood pressure, improving renal function, decreasing the need for dialysis, and improving QOL in patients with CKD. As CKD had a chronic course whether the results of our short-term study can be extrapolated to long-term benefits is yet to be explored. Large scale and multicentric trial with longer follow-up and comprehensive approach are needed to calibrate the benefits of yoga therapy and to assess its impact on the natural history of the disease. I express my deep sense of gratitude to Dr. Tung Vir Singh Arya (Professor and Head, Department of Internal Medicine, LLRM Medical College, Meerut, India) for encouraging us to do this study. Bangman JM, Shorecki K. Chronic kidney disease. In: Harrison's Principle of Internal Medicine. Vol. 17. USA: McGraw-Hill companies; 2008. p. 1761-71. Levin A, Hemmelgarn B, Culleton B, Tobe S, McFarlane P, Ruzicka M, et al. Guidelines for the management of chronic kidney disease. CMAJ 2008;179:1154-62. Centers for Disease Control and Prevention (CDC). Prevalence of chronic kidney disease and associated risk factors - United States, 1999-2004. MMWR Morb Mortal Wkly Rep 2007;56:161-5. Roth M, Roderick P, Mindell J. Kidney disease and renal function. In: Craig R, Mindell J, eds. Health survey for England 2010. Ch. 8, Leeds: NHS Information Centre, 2011. p. 1-27. Singh NP, Ingle GK, Saini VK, Jami A, Beniwal P, Lal M, et al. Prevalence of low glomerular filtration rate, proteinuria and associated risk factors in North India using Cockcroft-Gault and modification of diet in renal disease equation: An observational, cross-sectional study. BMC Nephrol 2009;10:4. Anupama YJ, Uma G. Prevalence of chronic kidney disease among adults in a rural community in South India: Results from the kidney disease screening (KIDS) project. Indian J Nephrol 2014;24:214-21. Himmelfarb J, Kliger AS. End-stage renal disease measures of quality. Annu Rev Med 2007;58:387-99. Briscoe DM, Sayegh MH. A rendezvous before rejection: Where do T cells meet transplant antigens? Nat Med 2002;8:220-2. Nayak NN, Shankar K. Yoga: A therapeutic approach. Phys Med Rehabil Clin N Am 2004;15:783-98, vi. Yogendra J, Yogendra HJ, Ambardekar S, Lele RD, Shetty S, Dave M, et al. Beneficial effects of yoga lifestyle on reversibility of ischaemic heart disease: Caring heart project of International Board of Yoga. J Assoc Physicians India 2004;52:283-9. Bijlani RL, Vempati RP, Yadav RK, Ray RB, Gupta V, Sharma R, et al. A brief but comprehensive lifestyle education program based on yoga reduces risk factors for cardiovascular disease and diabetes mellitus. J Altern Complement Med 2005;11:267-74. Sundar S, Agrawal SK, Singh VP, Bhattacharya SK, Udupa KN, Vaish SK. Role of yoga in management of essential hypertension. Acta Cardiol 1984;39:203-8. Okonta NR. Does yoga therapy reduce blood pressure in patients with hypertension? an integrative review. Holist Nurs Pract 2012;26:137-41. Kashinath GM, Hemant B, Praerna C, Nagarathna R, Nagendra HR. Role of yoga in chronic kidney disease: A hypothetical review. J Nephrol Ther 2014;4:1000167. Skevington SM, Lotfy M, O'Connell KA; WHOQOL Group. The World Health Organization's WHOQOL-BREF quality of life assessment: Psychometric properties and results of the international field trial. A report from the WHOQOL group. Qual Life Res 2004;13:299-310. Shende MR, John Parekh NA. Neuroanatomical and physiological correlates of yogic exercises on reaction time task. J Anat Soc India 2011;60:227-31. Gordon L, McGrowder DA, Pena YT, Cabrera E, Lawrence-Wright MB. Effect of yoga exercise therapy on oxidative stress indicators with end-stage renal disease on hemodialysis. Int J Yoga 2013;6:31-8. Schlaich MP, Socratous F, Hennebry S, Eikelis N, Lambert EA, Straznicky N, et al. Sympathetic activation in chronic renal failure. J Am Soc Nephrol 2009;20:933-9. Grassi G, Bertoli S, Seravalle G. Sympathetic nervous system: Role in hypertension and in chronic kidney disease. Curr Opin Nephrol Hypertens 2012;21:46-51. Udupa KN, Singh RH, Settiwar RM. Physiological and biochemical studies on the effect of yogic and certain other exercises. Indian J Med Res 1975;63:620-4. DiBona GF. Sympathetic nervous system and the kidney in hypertension. Curr Opin Nephrol Hypertens 2002;11:197-200. Yurtkuran M, Alp A, Yurtkuran M, Dilek K. A modified yoga-based exercise program in hemodialysis patients: A randomized controlled study. Complement Ther Med 2007;15:164-71. Bantornwan S, Watanapa WB, Hussarin P, Chatsiricharoenkul S, Larpparisuth N, Teerapornlertratt T, et al. Role of meditation in reducing sympathetic hyperactivity and improving quality of life in lupus nephritis patients with chronic kidney disease. J Med Assoc Thai 2014;97 Suppl 3:S101-7. Sharma NK, Robbins K, Wagner K, Colgrove YM. A randomized controlled pilot study of the therapeutic effects of yoga in people with Parkinson's disease. Int J Yoga 2015;8:74-9. Banth S, Ardebil MD. Effectiveness of mindfulness meditation on pain and quality of life of patients with chronic low back pain. Int J Yoga 2015;8:128-33.